The title of this Italian slice-of-life drama translates to Young Husbands. The husbands in question rather casually enter into marriage, never intending true fidelity to their spouses. When they realize that they're committed for life, our immature heroes return to their home town for one last fling. In the course of their final hours of bachelorhood, they come to the sobering conclusion that their carefree youth is not only past, it's already long past. Somewhat reminiscent of Fellini's I Vitelloni, Giovani Mariti boasts excellent performances from all concerned. A movie about the mixed feelings of young adulthood. It's sufficiently like (in theme) and unlike (in sensibility) to 'I Vitelloni', to make an interesting companion piece. 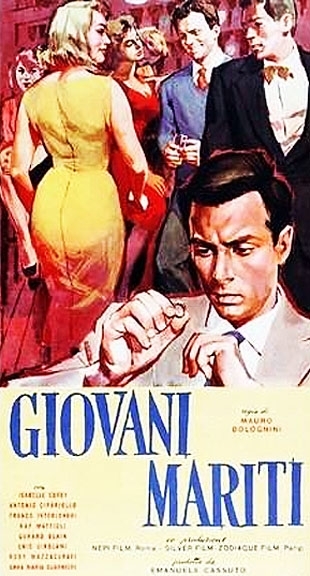 Thanks, MovieDetective, for so many Bolognini films.